This is a fantastic commentary, David; I’m happy to see you continuing it so soon after the last installment! 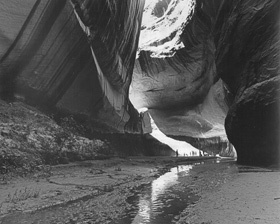 Its interesting to read your Dad saying how he had a little trouble warming up to the Colorado Plateau photographically–or at least trouble learning to cope with it. I feel the same way when I go to the dense forests and ocean. Regardless, I can sympathize with his need to digest the place…that area can be a tough stone to swallow, so to speak. The last couple of paragraphs speak volumes, too. Hi Greg, thanks for the feedback. I have been thinking it would be preferable in general to post follow up blog posts in more frequent succession. My father often talked about how the Sierra Nevada and other mountain ranges of the West Coast States exhibit a clear and obvious beauty. When photographing them Ansel Adams statement applies, “A good photograph is knowing where to stand.” While this is also often true in the Southwestern deserts, it is not as simply applied. Dad found that an unusual camera position, arrangement for a close up or other adjustments were often necessary. The desert is often stark and the beauty very subtle. Making the selection of what to include and exclude without the resulting image looking like every other desert landscape can be more challenging than merely pointing the camera at a beautiful mountain and lake scene. Even though the mountain and lake scene may also look like many other photographs, this is often forgiven by the viewer if the mountain landscape is different from others he or she has seen. Whereas the red rocks of Utah look much like the red rocks of Colorado, New Mexico, Arizona, California, Nevada, Oregon, Mexico or any other province with desert lands. Desert landscape photography for my father was more about finding nuances in various color shades or unusual arrangements of shapes more than discovering uncharted grand scenes of beauty, though he did a fair amount of the latter in both deserts and mountains. Love the post. It’s interesting to read your dad’s own words about his experiences. I’m sure learning to cope visually with unfamiliar surroundings is pretty common. I know I’ve struggled with it in the past, and still do. Thank you, PJ. It appears you’re going through that some now. I personally find the idea of photographing in Los Angeles just as exhilarating as in the wilderness, but I am still somewhat green in some ways and am at times playing the counterpart role to my father. On the other hand, my impression from your blog and our conversations is that your passion is more inclined toward northern wilderness landscapes. Nonetheless, you seem to be adjusting well as your images of the Southland are turning out wonderfully. You’re right — I’m much more tuned in to northern landscapes, but hopefully my fascination with abstract patterns, funky buildings, and other interesting things I see on the streets will serve me well once I really get my feet on the ground here. That’s what I noticed about you too PJ. You have a trained eye that picks up beauty in old doors, walls and all sorts of objects besides the natural scene. Wonderful post, David. This is one of my favorite photographs of your father’s. The majesty of the canyon walls is awe-inspiring. I wonder if the word “gulch” is strictly an American word. Hi Sharon, I appreciate your visit here. Cathedral In The Desert must have been incredibly beautiful before the canyon walls were caked with “Lake” Powell sediment. Even though most of Cathedral In The Desert is now out of the water due to a succession of droughts that have caused the reservoir to recede, it may take years, perhaps decades for the mud to wash off. Good question about the word “gulch.” Were your European blogging friends unfamiliar with the word? I just looked “gulch” up in the giant print Webster’s dictionary which says the word came from the Middle English “gulchen” meaning deep cleft. I definitely can sympathize with the “honeymoon” period of getting to know a new place photographically. Sometimes, I also notice that I have trouble connecting–photographically at least–with places I know quite well. Hi Greg, interesting what you say about getting to know a new place and connecting with familiar places photographically. I sometimes don’t connect to places I know well photographically because in some instances I find myself mistakenly thinking that I have photographed everything there is to photograph, which of course is impossible. I notice that other photographers make this same miscalculation, even the most seasoned professionals. By the time the river enters the Grand Canyon at its altitude has fallen to 3 110 feet dropping over one mile since its beginning. The river will drop another 2 200 f.eet before it reaches the other end of the Grand Canyon the 277 miles away…The river contains alternating sections of rapids and calm sections. The rapids represent only 10 percent of the rivers total length through the Grand Canyon but are responsible for more than half of the total drop in altitude…The Colorado River was originally named Rio Colorado or Red River by the Spanish. Thanks Business Daily, interesting information. The Colorado River after being named the Rio Colorado by the Spanish went through another period when it was named the Grand River through the Grand Canyon. John Wesley Powell had something to do with the naming at some point, but I don’t remember how it later became the Colorado River all the way from headwaters in the state of Colorado to the Sea of Cortez, or the Gulf of California in Mexico. I suppose it is easy enough to look up.